LBBG 2cy L - 51910 September 22 2002, Le Portel, NW France. The primary moult stage is slightly below average for 2cy Lesser Black-backed Gulls with P8 fully grown and P9 only an inch shorter than P8. The rectrices are all second generation tail-feathers with the fringes at the tips worn away and the centres already turning paler brown. All secondaries are replaced. The second generation wing-coverts which were replaced in the complete moult last summer show a diffuse smudgy pattern of fine vermiculated barring. The partial wing-covert moult is well visible with the second tertial included in this moult: it's replaced for a third generation tertial, very much resembling the second generation tertials in pattern. Greater covert #2 has been replaced, medians #2-3 have been replaced and in the outer tract the medians are missing. The outer lower lesser coverts are missing as well. The lesser coverts are all second generation, probably moulted last in the complete moult. 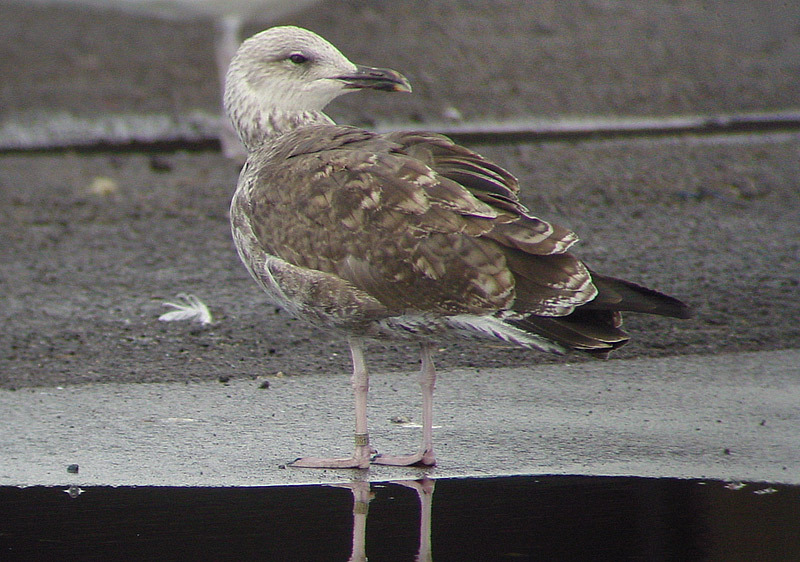 Note the combination of very worn and bleached scapulars and the very fresh grey-based feathers, still showing an anchor pattern. This is a smaller (female?) graellsii LBBG from Belgium.